Sixteen-year-old Pippa Greene never goes anywhere without her camera. She and her best friend/supermodel-in-training Dace long ago mapped out their life plan: Pippa will be the noted fashion photographer, and Dace the cover girl. But ever since last spring, things have changed for Pippa—and her junior year at Spalding High proves to have its own set of challenges. Not only is Vantage Point, the statewide photography competition, in three short weeks, but her mandatory volunteering placement lands her at St. Christopher’s Hospital, a place Pippa never wanted to set foot in again. With humor and pluck, she navigates her new role as a candy striper (watch out for Code Yellows), her changing relationship with her best friend (goodbye, Honesty Pact), and—perhaps most stressful of all—her new love interests (yes, love interests plural). Will Pippa make it to Vantage Point without having a panic attack? Will either one of the guys prove less sketchy than her last boyfriend? Can she and Dace figure out a way to dream big and be best friends? One thing is certain: real life is a lot more complicated than a photograph. 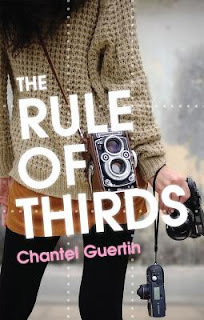 The Rule of Thirds was a very cute and light read. I really enjoyed reading this one. It didn't go too deep, emotionally, and that's what I really liked about it. It wasn't heavy. I really enjoyed Pippa's character, but the only fault I had with her was that she wasn't very good with sticking up for herself. One of her love interests, Ben, is a bit pushy and too into himself and Pippa never really sticks up for herself with him. She just lets him walk all over her. Every time she had the chance to defend herself she would just back down, which really had me disappointed in her. I did, on the other hand, really like her other love interest, Dylan. He was a little bit aloof in the story, but at the end there is an explanation for it all, and it really makes you love him more. This book is a very quick read and not long at all. It really is the kind of contemporary novel that you read just because you felt like reading. It isn't too heavy or dark, and just really has an air about it that makes you feel good for reading it. I did read the ARC (advanced reader copy) of this book, so typo's and things are completely expected. However, for the most part it was very clean and well written. There were only two scenes that were messed up and didn't make sense so it just threw me off the story for a second, until I could figure out what was going on. Finally, I think the ending was perfect. It really tied everything up nicely, but at the same time it wasn't too clean. It was just the sort of ending this book really needed. Very nice read. I really loved how light the story was, and that it wasn't too emotionally deep. It made for a nice airy story to read when you are just in the mood for reading. I really liked Pippa, but I was just very disappointed that she never stood up for herself when she needed to. She let people walk on her too much. I really liked the ending of this book, and thought it tied everything up nicely. It wasn't too clean or too messy.